Matt Damon narrates this low-key but shrewd documentary outlining the financial scandal of 2008. Through interviews with economists and politicians, this film reveals how close the USA came to the brink of bankruptcy and why it could so easily happen again. As a result of a mix of banking deregulation in the US and a bonus culture in the UK, the West entered into an era of casino capitalism. Beginning with the bankruptcy of Iceland, a country once labelled the safest financial bet in the world, the film explains how their banks became greedy, over-expanded, and then fell, bringing the country to its knees. This film strips the layers of mystery that surround the banking world and show us that under laboratory conditions, human brains given money for a task will react similarly to cocaine users. 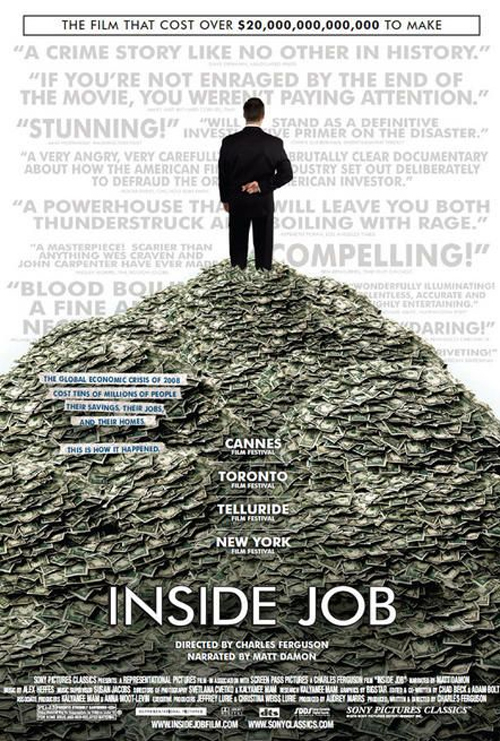 This documentary isn’t always easy to follow, but that’s part of the fraud: Inside Job tries to show us that the recent crises are not part of an unforeseeable force majeure but the inevitable consequence of a system that manipulates the law at the for the gratification of a few and at the expense of the majority. Unlike any of Michael Moore’s films that border on the hysterical in their one-sidedness, this is a sharp study of corporate greed in a beautifully restrained attempt to alert us to the robbery that has been, and is, going on in plain sight.